I had the pleasure of experiencing a true bottleneck operation a couple of weeks ago. 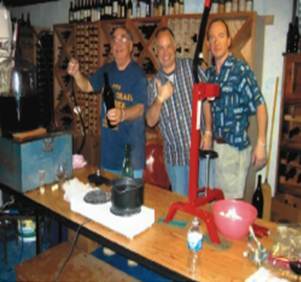 My friend Dave makes his own wine and each year I lend a hand to bottle the results along with a few volunteers (his Dad and wife). I’ve helped Dave do this a few times over the last couple of years. This year, knowing my background in lean, he asked if I would help streamline his operation so we could have better flow (pun intended). Now, bottling this wine is more a labor of love than trying to reduce waste or understand value from the customer’s point-of-view. But I can understand that when we have a few hundred bottles to do (I’m exaggerating a little – it just felt like that many) that Dave wouldn’t want to have to spend all day doing it. As you can see from the Value Stream Map there is a lot of waste, but without going to gemba, you might not recognize it just from the VSM. You see that for the most part it is a push system, each operation pushing bottles ahead to the next operation whether they are ready for them or not. You may also notice that there is plenty of transportation waste; moving the bottles upstairs to the kitchen for sealing and labeling (and ultimately back downstairs). You may say that adjusting the fill level in the bottle is also waste; I would agree. It’s just that we haven’t fixed the filling operation yet to give us the perfect poor (the bottles come in various sizes and shapes). So after all this analysis you may feel the need to roll-up your sleeves to make this a more streamlined operation with flow (pun intended – again). But, I can save you the trouble. The true bottleneck was at Dave’s process “Adjusting”. He was always talking, wanting to take pictures, commenting on the wine and generally not paying attention to his work. So the bottleneck in this operation was Dave (sorry Dave). Since Dave is the “Herbie” (from Eli Goldratt’s book “The Goal”) we should probably put him up front next year maybe with his Dad to keep him on track! So in reality, I wouldn’t change a thing. We have fun doing this and since we are the ultimate customer, we just enjoy our day. O.k., I may want to make some improvements next year; hey, it’s my nature. « Be cool this summer with our new Navy Blue 5S t-shirts!